The Church is very much part of the Community. With the warm atmosphere and friendly conversation of the Wednesday and Saturday Terrace Community Cafes, all who need and want it are provided with a brief respite from the day-to-day pressures of daily life. For the past few years the Church has been a certificated Fairtrade Church and works hard to promote Fairtrade awareness through all of its activities.The Church also participates each year in a variety of ways as part of Fairtrade Fortnight. The church participates in the City "Doors Open" day in early September, highlighting the activities of those who use the church premises. 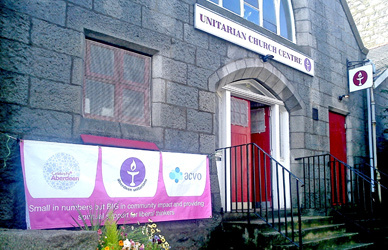 Meetings of the Aberdeen and North-East Scotland Family History Society also take place but on a monthly basis. The MAIN HALL on the ground floor, which has a sprung, wooden floor and 4m high suspended ceiling, has a flexible seating capacity for around 70. There is a raised dais at one end. A roller serving hatch gives access to a small kitchen which can be used for the preparation of light refreshments. A sound system with hearing loop is available. Toilets, including an accessible toilet are accessed off the entry foyer. On the upper floor, the 30m2 recently refurbished "Inkson" Meeting/Quiet room with a flexible seating arrangement for around 20 people is also available. A large number of folding tables are available for use in either space. Heating throughout is provided by warm air. Please note, wheelchair access to the property is currently problematical due to the close proximity of the steeply sloping Skene Terrace pavement and steps up to the entrance but can be organised with appropriate notice.